The 31 Day Writing Challenge! 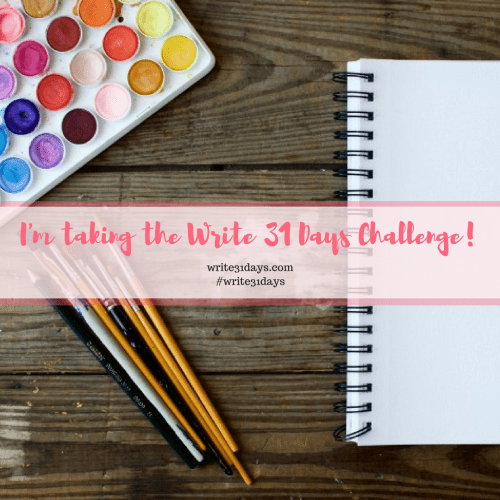 Have you heard of the 31 Day Writing Challenge? It’s a group of writers that get together and are challenged to write once a day and share their writing with each other and the world. I made a feeble attempt to do this last year with the main theme of Simplicity and Organization Last years announcement post, Shelf Organization, Closet Purge, Cabinet Doors, and then I started getting lazy well actually I started not feeling so good and then had to get back surgery last December. It put a damper on my 31 day challenge last year. #1 I AM going to complete the challenge. #2 I am having elective surgery and want to share how I’m preparing for it this time around. I’m hoping the next 31 days of writing will help others that have surgery coming up. Bookmark and check this post throughout the month of October. Below, links will be added daily for the Simple Steps for Living Life: Prepping for Surgery series. Good idea! I should chronicle my 30 days to moving! That would be helpful to sooo many people! I just googled how many people move in the US per year and it said something like 40million! This is something to keep in mind after I have gone through my adjustment period of having one to two. It would also help to share post op issues. I’ve had 20 surgeries. My goodness! I’m sorry you’ve had to have 20!!! That’s a great idea. I’ll be adding post op articles as well. I wish I had follow-through on a writing challenge. Good for you for making that goal and for being willing to share your experience with others. I have had several back surgeries and a couple abdominal surgeries so I understand your nervousness. Rest is a good thing so get plenty. Writing is truly the best medicine and I sincerely wish all the best of luck and success to you! I look forward to reading your work! Oh that sounds like a fun challenge! I cant wait to read them…good luck with your surgery! I should really try to do this. I have always wanted to write and try but then end up blank when I start. Writing is an amazing talent thats for sure. Good luck with everything! I go blank when I’m writing sometimes too. Well, let’s face it, I go blank when I’m not writing and just going about my day sometimes. haha! Ok, seriously, I’ve read a bunch of articles on tips for writing, brainstorming ideas, etc. My favorite way to start writing is just journaling something I’m going through and then seeing how I can write about what I’ve faced to be able to help others. 🙂 That’s where the Prepping for Surgery series came from. Hope this helps! I like to read others materials but don’t feel like writing myself. So nice of you hope you will recover fast. Hope your surgeries go well! I’ll be adding more posts this week about prepping for surgery. There’s lots to think about but I’m trying to write to hopefully make it easier on anyone facing surgery. 🙂 Thanks so much for visiting! Best of luck with your writing challenge and your surgery! I hope all goes well for you. I was in your shoes back in April. It was pretty bad at first, but I’m feeling much better now! Yikes! Sorry it didn’t go so good at first. I’m a little nervous about how painful after surgery will be. My pain tolerance is pretty good(drilled a screw into my thumbnail once and didn’t notice – yep, I’m weird) but abdominal surgery is one of the 2 top painful surgeries that a person can have. Glad to know you are feeling much better!!! Very interesting having a writing group get together like this! Good luck, look forward to your writing. Hope all goes well and looking forward to see what you write.